More and more homeowners are choosing to abandon the idea of using a curtain or door to enter their shower space. As open-plan living and easy access to every space in the home becomes more achievable, the concept of indoor flow is making its way to bathroom and bathing spaces. At Bright Renovation, our range of walk-in shower panels will open up your Melbourne home even further and create contemporary-yet-timeless styling in your bathroom. 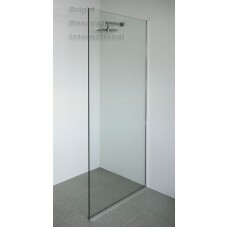 This entire range of semi-frameless products is constructed from 10mm-thick toughened safety glass, which resists all kinds of impacts and will stand up to regular, every-day wear and tear. As this shower style generally uses only one glass panel, we ensure that every one of these products can stand on its own, stylistically and construction-wise. Their frames are specifically designed to create as minimal a profile as possible, while reliably holding the panel secure and preventing any moisture seepage to the wall or installation area. These panels are also available in a wide range of sizes, from 900mm by 2,000 mm to 1,500 mm to 2,000 mm. It’s easy to fulfil your space requirements using our walk-in shower panels. * Australian Standard Product * 10mm Tempered Toughen Safety Glass * 550mm x 2000mm ..
* Australian Standard Product * 10mm Tempered Toughen Safety Glass * 600mm x 2000mm ..
* Australian Standard Product * 10mm Tempered Toughen Safety Glass * 700mm x 200..
* Australian Standard Product * 10mm Tempered Toughen Safety Glass * 800mm x 2000mm ..
* Australian Standard Product * 10mm Tempered Toughen Safety Glass * 865mm x 2000m..
* Australian Standard Product * 10mm Tempered Toughen Safety Glass * 900mm x 2000mm * Supp..
* Australian Standard Product * 10mm Tempered Toughen Safety Glass * 1000mm x 2000mm * Sup..
* Australian Standard Product * 10mm Tempered Toughen Safety Glass * 1100mm x 2000mm * S..
* Australian Standard Product * 10mm Tempered Toughen Safety Glass * 1200mm x 2000mm * Sup..
* Australian Standard Product * 10mm Tempered Toughen Safety Glass * 1360mm x 2000mm *..
* Australian Standard Product * 10mm Tempered Toughen Safety Glass * 1500mm x 2000mm * Sup..